The general reception of these precious insights was altogether different: seldom have the work and gifts of a great initiate been so denigrated and ridiculed, especially by the religious and scientific communities of the day. Even now, after a hundred and thirty five or so years, Blavatsky is regularly dismissed as a charlatan, a spiritual medium and a “dishonest faker”. So vehement and so worldwide was this condemnation that much of this negativity still clings to her name. And, to Theosophy itself. Madame Blavatsky was 4.0 degrees initiate, almost a Master, equal in level to the Disciple Jesus and close to that of the great Leonardo da Vinci. How is it is possible that such a distinguished Toiler for the Good could be so maligned? Jesus himself is a prime example of how ignorance and fear can dominate the perceptions of men. Even while overshadowed by Maitreya the Christ, Jesus was made to suffer from these twin attributes of thoughtless men. Today the world is grappling with many problems and, predictably, schisms have arisen in assessing these problems and in overcoming them. Men and women everywhere have different qualities of mind and brain, of openness or otherwise to ideas new and unfamiliar. They also stand at different points on a ladder of evolution and from near the bottom of the ladder the work and insights of many of those above them mean little or naught. Thus has it always been. From now on, however, this age-old problem will be ameliorated to the benefit of all. The presence of Maitreya and a growing number of His group of Masters will bring to humanity a great leavening. Much of the simpler levels of the Ageless Wisdom Teachings will be placed before the world as a whole, drawing more and more of the general public into Theosophy and its teachings. This will help to prepare large numbers to stand before the Initiator and to enter consciously into the Light. In this way, many men and women, taking advantage of this new situation, will prosper greatly on their journey of evolution. When Maitreya steps forward, this process will begin. More and more, as they respond to Him, they will find growing within themselves an appetite for the truth, and a longing for wisdom and light. Q. (1) Apart from the Observatory of Malta, are there other scientific institutions aware of the presence of the ‘star’? (2) Which is the best way of accelerating the public awareness of the ‘star’ and its significance? (3) Are any countries more aware of the ‘star’ than others? Many UFO groups detect large spaceships but are not aware of their meaning. A. (1) I cannot believe that serious workers in the world’s observatories have not seen the ‘star’ — they must have taken note of it, but not understanding its significance, they probably dismissed it. Whenever someone unacquainted with astronomy contacts such a professional body they are fobbed off with remarks like, it was probably Jupiter or Venus, or some other planet in our system. They dismiss, a priori, the possibility of finding something new, like Maitreya’s ‘star’. Ordinary people are upstaged by this response and believe the astronomers. This of course is true of media as well, who need some professional person in astronomy to admit the existence of the ‘star’. However, there was good footage of the ‘star’ on Japanese Fuji Television [17 July 2009] for 1 minute 47 seconds of the ‘star’ doing its ‘tricks’ twirling round, moving, changing colour and size. (2) a: Talk about it. b: Photograph it if possible and send the photographs to local media and/or Share International. (3) No. Q. I am confused about the connection between Maitreya and beings from other planets, e.g. the large spaceships that are appearing as the ‘star’. What is the connection between Maitreya and these Beings? Why would they be involved in His coming? A. We are all part of one unitary solar system. The public may not generally know about, or believe in, the reality of life on other planets of our system but the Hierarchies of all the planets are in contact. There is indeed a kind of Interplanetary Parliament representing all the planets. The Space Brothers are here to help the people of Earth to overcome the difficulties which our own ignorance has brought about and to work with Maitreya, and our Spiritual Hierarchy as a whole, in the work of salvage. It is a spiritual mission. 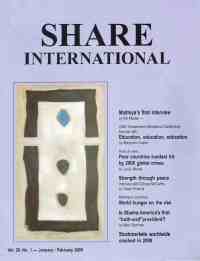 Q. I have been working with the image of Maitreya’s ‘hand’ by simply looking at it. I feel all kinds of healings going on. At the moment I also seem to see the image of a man’s face within the hand, roughly below the last two fingers. (1) Is this a guide working with me, or (2) just my imagination? A. (1) No. (2) Just imagination. The energies come from Maitreya. Q. Pope Benedict claims that bones found in Rome in June 2009 belong to St Peter. (1) Are they indeed St Peter’s bones? (2) If not, who did they belong to? A. (1) My information is that this is not the case. (2) Unknown. Q. I attended several of Benjamin Creme’s lecture meetings at Friends Meeting House, in Euston, London, between 1985 and 1987. I believe the overshadowing of Benjamin Creme to be totally genuine; however, the statement about the emergence of the Lord Maitreya, in the way it is described, is somewhat premature. A thousand years from today, would be more accurate. These times are too turbulent surely? I have waited for so long, so very, very, very, very long, and I mean trans-incarnationally, from lifetime to lifetime, to see the re-emergence of something like we had in the Golden Age of Atlantis; the city of the Golden Gates, in more ways than one; the spiritual core of that city, scanning consciously the spiritual horizons from age to age, incarnation to incarnation, waiting patiently. Suffering the frozen wastes of the Ice Age after the destruction of the last remnant of Atlantis, looking forward to this time of a new re-kindling of a civilization of sorts. This 20th/21st century time frame although critical does not seem totally right for the emergence of the Lord Maitreya. I wish it was! A. To my mind this is only one of many (erroneous) views of the coming of Maitreya and His group of Masters: the externalization of the Spiritual Hierarchy. No one should know better the actual timing of this event than the Masters Themselves. One of them, the Master Djwhal Khul, in the Alice Bailey teachings, gave the hope and possibility of the Christ’s return around the middle of last century, that is around 1950, or failing that, towards the end of the 20th century. My information has been that Maitreya, the Master of all the Masters, descended from His mountain in the Himalayas in July 1977 and entered London (His point of focus in the modern world) on 19 July 1977, very close to the prediction from the Master DK already published in The Reappearance of the Christ by Alice Bailey (Lucis Trust). Q. It is said by many learned people that the ‘swine flu’ is being genetically engineered intentionally by a pharmaceutical agency or indeed agencies as another means of attempting to de-populate the Earth’s human species. This information has come from a very elevated medical practitioner who is the head of the world health federation, who also says that people should not accept the vaccination due to it being none other than waste product, as another means of destroying the best part of humanity. Is there any truth at all in this information? A. No, none whatsoever. That does not mean that the vaccine is totally harmless. Q. Hulda Clark, an Australian doctor, states that an excess of micro-organisms (viruses, bacteria, fungi) in the human body, in addition to toxic substances and metals, weakens the immune system, inducing numerous diseases such as chronic fatigue, cancer, AIDS, and so on. She had experimented using an electronic machine, whose frequencies kill those pathogens. With an appropriate diet, intestine cleaning and other prescriptions, she obtains very good results in cases of cancer, AIDS and other diseases. Could this medical proposal help people with this kind of disease, taking into consideration the Karmic Law? A. Yes it could, if correctly prescribed and the diagnosis was correct. The whole of humanity is under threat from this pollution. Q. The Nazarene Healing Centre in Coin, Malaga, Spain, is well-known for performing spiritual psychic surgery, working on the patient’s etheric body in order to heal them. Some of the operations have impressive results. Vibhuti from Sai Baba is often used to heal the wounds. There are many photographs of both healers, Esteban Molina and Stephen Turoff, in which one can see the energies involved in the process. The healers state that they work with a medical team from the 6th astral plane, composed of around 17 specialists that perform the healings ‘using’ the bodies of Esteban and Stephen. They also claim that they are ‘informed’ that the healing energies come from the Master Jesus, Sai Baba and the Master Who was the Madonna. (1) Could you confirm if it is true that doctors from the astral plane work through the healers? (2) Are the Master Jesus, Sai Baba and the Master Who was the Madonna involved in the healing process? (3) The water from a well used in the Centre is said to have healing properties. Is that correct? A. (1) Yes. (2) They give Their energy when called upon. (3) Yes. Q. In Jules Verne’s Journey to the Centre of the Earth, he describes the existence of underground human beings’ communities, some uncivilized and aggressive, and others with an advanced level of development. Recently, some books of Trigueirinho describe the existence of an underground human civilization. (1) Is there an underground human civilization on Earth? (2) Are there underground human civilizations in other planets of the Solar System? (3) If yes, in which one? A. (1) My information is that this is not so. ( (2) Yes. (3) Not given. Q. If a nuclear reactor is built, but never operational (ie never turned on) (1) can it still pose a threat of polluting the environment and atmosphere? Likewise, (2) if a reactor is shut down, can it still pose a threat if idle or during the dismantling process? (3) If so, how serious a threat would it be? A. (1) Yes. (2) Yes. (3) It depends on the skill in handling them. Q. In Addis Ababa, Ethiopia, water at the church N’toto Maria is believed to have healing powers. Has water at the site been magnetized and if so by whom? Q. I just watched a television programme about honey bees dying off – which is quite troubling – what does Maitreya have to say about this? What is causing it and what can be done to save the bees? Without them we are goners. A. Maitreya has not, so far as I know, addressed the question of bees, which are indeed dying worldwide, mainly as a result of our use (misuse) of pesticides and the change of habitat produced by global warming. The answer lies within our hands: reform our agricultural practices and stop using the earth as a dumping ground for our noxious gases. Q. Is there a group of men controlling the events of the world? Their aim being the enslavement of the peoples of the world. A. No. This is one of dozens of scaremongering ‘conspiracy theories’ streaming out, mainly from America I’m sorry to say, and America as a whole, we have to admit, is quite paranoid in relation to attacks from abroad. No doubt there are small groups of men in many countries who think up ways and means of controlling the world but it will never happen; these are just neurotic dreams. On Tuesday 18 August 2009 I was preoccupied all day by the news that a close friend and colleague was not expected to live for long, in fact she was not expected to make it through the night. I couldn’t concentrate on work at the Share International office and after supper, had some wine and took the bus home. Needing some fresh air I sat on a bench outside my flat. I was basically feeling really upset about my friend. Then a stout man with blond hair and a beard cycled up and asked if there was anywhere he could get a coffee. It was already 11pm so I suggested the pub down the road. His bike was painted all over with a jazzy design and he seemed very jovial. He rode off to the pub and returned 5 minutes later with a glass of coca-cola. He had an accent I couldn’t work out so I asked where he came from: “It is too complicated to explain,” he said, and mentioned something about Russia and other countries, all very quickly. Then he asked me: “Are you a goth?” I was wearing a black cardigan and leggings. I laughed and said no. Then he sat down on the next bench. He was exuberant and entertaining and his banter cheered me up. He said he didn’t like to sleep and he’d often cycle around looking at places late at night. Then he showed me some photographs on his mobile phone: they were great images. The first was a perfect illustration of a heart that he told me he had drawn for a medical textbook. The rest were unusual photographs of nature and cities – all very interesting and beautiful. I mentioned my friend and we talked about death and re-incarnation and I spoke about Maitreya. He said he knew about Benjamin Creme and his work and the Theosophical Teachings. We chatted on for some time about the ‘star’ and he spoke about trying to photograph it, possibly from inside the church nearby. Then, realizing it was getting late, I said goodbye and got up from the bench. He watched as I walked to my door, and we waved. I felt comforted and distracted by our meeting and thought how strange life can be: sweet things happen when you least expect them and we’re never really alone. Please could I ask: was this jovial man a Master? (1) On 4 September 2009 I was travelling to Transmission Meditation in London. I was late and rushed hurriedly down the escalators and caught the end carriage of the waiting tube at Victoria and found a seat. A gothically-dressed tramp was sitting opposite me facing the end of the carriage; his dreadlocked hair had been slept on and was sticking out at all angles and unusually he had pale cut-off shorts over his black trousers. Then followed a scenario of short events. His hands were filthy and were holding a very cheap plastic egg-timer with brightly-coloured tiny sweets inside. The little sweets fell through the opening and with great delight he turned the egg-timer over, balanced it on his knee and gesticulated with his hands while turning around to everyone, nodding and smiling with extraordinarily kind, crinkly, sea-green eyes. He put it into a small orange plastic carrier bag which was behind him and took out a small rectangular, labyrinth game, but instead of silver balls, he was manoeuvering plastic cars through the maze. Then he looked round very lovingly at all the passengers. He put that away in the orange carrier bag and rapidly brought out a white, paperback book at which I caught my breath. It was entitled The Source of the Heart; below the title was the sketch of a long-haired Indian. I could not see the author’s name. He put it on his knee and opened it to where several white origami shapes were kept and took one out showing it to everyone saying in a soft voice: “Boat, boat, boat.” The other passengers shuffled uncomfortably, holding up their newspapers, trying to avoid any contact with this ‘undesirable’. The next shape was a bird, but he seemed to change his mind and the book swiftly found its way into the little bag. He leaned over to the adjoining seat and put the book into two large carrier bags placed there, an orange and a blue, one inside the other as these were carrying large heavy, glass bottles full of soft drinks. He took out a well-tied, black, small carrier bag whose contents he did not display, simply taking the handles and tying knot after knot until he was satisfied, then he stowed the black bag into the very bottom of the larger carrier bags, nodded, looked smilingly back at me, then leaned back in his seat and fell asleep. He gathered his bags and left at the next station. Was this a message for all the co-workers of Share International and beyond and would you confirm if this was Maitreya? (2) I was driving my two sisters home after Transmission Meditation late one night when we had to stop at a set of traffic lights. It was almost midnight and there was a short Hispanic-looking man with curly black hair and dark brown eyes washing car windscreens. My sister Annette was unwell and was leaning back on a pillow, half-asleep in the front seat. I leaned across her and rummaged in the glove box for some loose change. Just as the window cleaner approached our car, the lights changed, so I gave him what I had, preparing to drive on. “But that is too much!” he protested, but it was very little so I asked him to keep it. Suddenly, the lights were red again. He approached the rear of the car and began to wash the back window while singing a melody. He had a rich voice. “He is singing even at this late hour!” I was surprised. twinkling in the city lights. The traffic lights changed to green and off we sped into the dark, laughing, our spirits uplifted. Would you kindly tell us if he was a Master? S. P., Ashurst Wood, West Sussex, UK. I was recently sitting in my room saying ‘The Great Invocation’ in Finnish. I felt very calm and peaceful. When I left my position and went to the kitchen, I saw, or I think I saw, a handprint on the oven glass-wall. I felt incredible peace and safety, but when I checked up close the handprint faded away. The feeling was inhumanly comfortable. What could this be? On 21 November 2008, I attended a conference in Lyon (France) during which the audience was shown a heart-shaped agate gemstone found in Uruguay by a miner’s son about 40 years ago. When it was discovered, the stone broke in half revealing an inscription: a ‘J’, a ‘C’ as well as other letters, in very luminous crystals against a background of smooth agate. The inside of the heart replicates exactly the shape of a human heart. When the miner’s son discovered the heart-shaped stone, he signed away his inheritance of the land and the house, and has since devoted himself entirely to the service of the heart stone, lending it to people who need it. The large audience (more than a hundred people) was extremely meditative and the energy generated by the heart-shaped stone – that we were able to hold in our hands for a few minutes – was intense: I was able to feel it several centimetres away and my stomach pains soothed. A person in the audience took a photo of myself holding the stone. 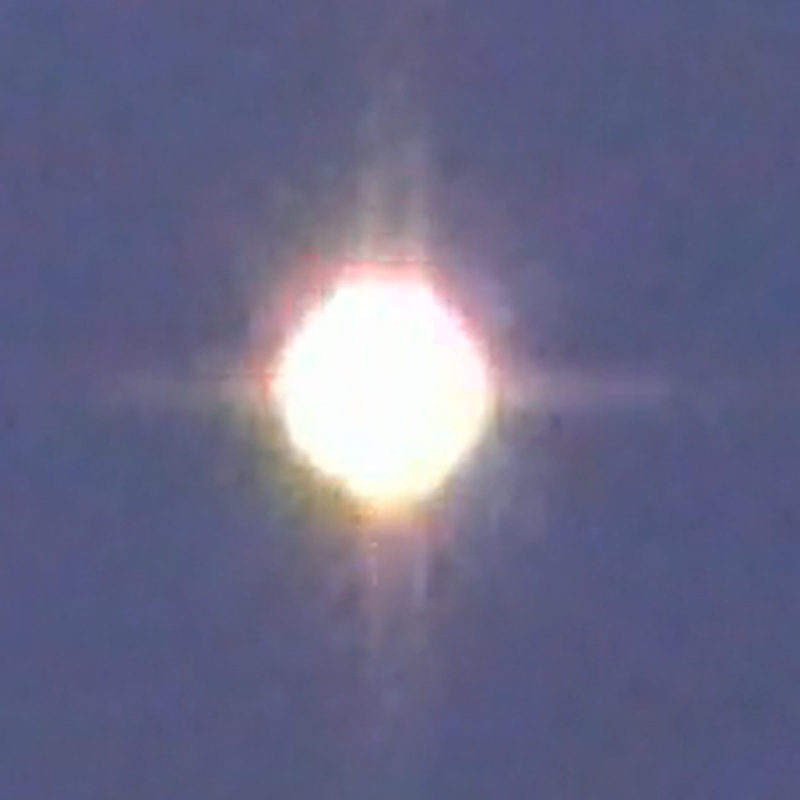 The developed photo showed a column of light (see photo). Was it a blessing from Maitreya? What do the inscriptions inside the heart mean? Is this heart-shaped stone of divine origin and what is its purpose? 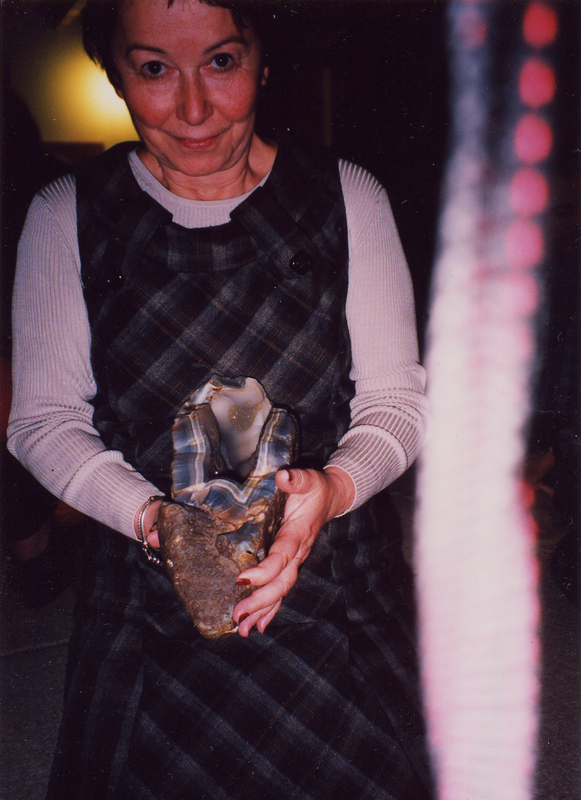 Blessing from Maitreya on a photograph of G. J. holding the heart-shaped agate. We present a selection of quotations on the theme of Truth from Maitreya (Messages from Maitreya the Christ, and Maitreya’s Teachings – The Laws of Life), Benjamin Creme’s Master (A Master Speaks and Share International), and Benjamin Creme’s writings. Most people have both glamours and illusions. Illusions deal with ideas, with mental thoughtforms. Everybody has them. The world’s mental body, the mental plane, is filled with billions of thoughtforms – huge, small, ever-growing, always changing. These are mental thoughtforms. ... Maitreya will guide the thoughts of men towards the Truth that He brings and is. Thus will Maitreya show men their errors and the solution to their dilemma, and thus will men take stock of their situation and, in growing numbers, realize the Truth of His advice. More and more, men will see that Maitreya’s guidance is the only way to achieve the happiness and peace all inwardly crave. Held back by fear until then, they will find in His simple Teaching the answer to all their fears and woes. My Masters will serve you, too, will teach you to live together in true brotherhood, in justice and harmony. Forget not, My brothers, that you are One, that the Father of All has created you in His divine image, that through you shines the same blessed light of Love and Truth. People are afraid of becoming fanatical. The danger really is not fanaticism but inertia. It is very difficult for groups who have not directly experienced Maitreya to go on year after year maintaining a high degree of activity around His appearance. It is true that Transmission Meditation and your personal meditation help to sustain a high level of commitment. But it does require faith. If you do not have faith, if it is simply hope and belief that Maitreya is here, against all the odds, then you are working against the grain. You have to know. There are many today who admit the necessity for change, but still resist it. There are many today who see the crumbling of the old and outworn world of the past, but cling to the old forms. But there is a new voice being heard among the nations: the voice of Truth, which contains the hope, the promise, of the New Time. This voice will increasingly make its impress on the minds of men, for it is the voice of God, speaking through men. This shows how, from the point of view of Hierarchy looking at the world, They see the glamours, They see reality. They see and know that what we see is entirely different from the truth. The truth cannot be seen by the soul because the personality does not allow the soul to see the truth. We have hidden the truth. We see the idea. Out of our false language, false education, our ignorance, lack of understanding, we interpret according to the ‘norm’, the academic line, the accepted understanding, whether that is political, religious or academic. We accept the status quo, in other words. That is because we are afraid to make changes. We are afraid to change so we do not see the need for change. We cover the need for change, the reality which is there, the true state of the world, the pain, the suffering, the insecurity of the world. I do not mean only terrorism, but the insecurity of life, including, of course today, terrorism, because we do not want to see it. It is too upsetting, too frightening, and so we cover it over with illusion. We fill every fragment of life with illusion. The intuition is the light of the soul, the buddhic level of the soul working directly through the mind. When the mind is cleared of illusion, the buddhi or intuition itself can manifest. When intuition or buddhi manifests, it automatically clears the mind of the individual from all these illusions. It is like cleaning house. One day you go into a house and see the cobwebs. You have been in that house every day for years and you never saw that the place is covered with cobwebs. One day when you notice the cobwebs you take a brush and start to clear them. During Benjamin Creme’s talk in San Francisco, USA, on 2 August 2009, he gave the following discourse on the Day of Declaration. The Christ will point to the need of the world to see itself as One. We are One world. We must make our world One, with war a thing of the past. Then the Masters can help us. Then They can show us the way to build the most wonderful civilization this earth has ever seen. This coming civilization will be created by humanity – inspired, guided and led by the Masters. We will have these men without fault living among us. Maitreya is a man like us but without any fault whatsoever. He knows only total altruistic love. He uses all His extraordinary intelligence, wisdom and love to help humanity forward, to shield and protect us. When Maitreya says: “I am your shield”, He means it absolutely concretely. The Masters and, above all, Maitreya, are our shield – shielding us from suffering, from too great an evil in the world which would submerge humanity. He is here to present to us an image of perfection to which we can aspire. Maitreya has given to the world all the signs – the milk miracle , statues which move and open their eyes, paintings which weep real tears – as signs that something tremendous is happening. There are thousands of miracles all over the world so that Time magazine devoted an eight-page spread to it [in April 1995]: “Something extraordinary is happening in the world,” it said. That something is the Reappearance of the Christ and the Masters of Wisdom in the world as our Elder Brothers. Very soon now Maitreya will appear on television in this country [USA] and later in Japan and then around the world and speak very simply so that everyone can understand Him and when Maitreya talks you know it is true. He speaks directly from the heart to the heart and that energy which comes from being the embodiment of Love awakens that love in your heart and you believe what He says because you know it is true. It is the only truth there is. It has to be true. You feel it deeply within you. There’s no gainsaying that simple message of trust, of hope, of sharing, of justice and of peace as a result. When enough people are responding to Maitreya in this way He will be asked to come on television and speak to the whole world – now known to many as the Christ. Many will see Him and think: “I’m sure that is the man Creme has been talking about.” The television networks will be linked together for this event and “All eyes will see him” as it says in the Bible. You will see His face – you will feel that energy – you will say: “Only the Christ could fill my heart with that love”. Maitreya is omniscient and omnipresent and one day all adult people in the world will hear His voice inwardly. He will, for 25 minutes or so, create this liaison, this telepathic rapport, between Him and us, and you will know that what you are hearing is the truth. One of the Masters has said: “People everywhere will become like little children”, full of trust, full of love, full of goodness, full of hope, full of aspiration with all that they have lost since growing up, before they become hardened, become commercialized, made rigid, fearful, untrusting – only half a man or half a woman. But as children they will feel this is true. “I am part of the whole world.” They will feel connected to one another, as they never have before, not since they were children. They will feel that union that a child always feels if correctly brought up and it is never drilled out of him or her. They will feel saintly, they will feel at their best, at their most holy, as they never felt since they took first communion, if they did. Not since they were little children and they believed what their parents said and they knew their parents would look after them. Then they believed in God and they knew that God would look after them. And then they knew about the Pope and that he would look after them, but he didn’t and they got let down and got hardened. They became disbelievers and began to lose their humanity. They began to lose that thread that connects each person with every other person in the whole of the universe on all planets and all systems. We are One. There is only one humanity under the one God and we all share that humanity. On the Day of Declaration as Maitreya’s energy of love pours out to humanity this will evoke an outburst of our own love – we will feel it, we will recognize it and see that this message is true. Everything that is said is true. Our hearts will tell us this is the truth; it could not be otherwise. So, we must share, we must live in right relationship, we must make justice, must put war behind us, never discolour this earth again with war. Maitreya will show us how old we are, for how long we have evolved and from what a height we have fallen to this base materiality of today when commercialization through market forces is squeezing the life-blood out of humanity, in which people are suffering ignominy for no reason but that they were born poor – who have no stake in life because they were born too poor. Maitreya will also show humanity glimpses of the coming civilization – the beautiful cities we shall have, the type of architecture now being planned by Masters to be given to the world. While this is going on there will be hundreds of thousands of spontaneous healings. By the telepathic rapport and the overshadowing of the minds and hearts of people everywhere, by the outflow of the Christ Principle, the energy of love, and by the miraculous healings, you will know that that One is the Christ. On the Day of Declaration you will know with absolute certainty that the time of doubt is over. This is the time in which Christ takes His place outwardly as the Head of Hierarchy, as the Eldest of all the Brothers of humanity, to stand before us and to take us forward into that Kingdom of which He is the Head – the Spiritual Kingdom which daily is growing out of the human kingdom, as a man or woman here and there take initiation and gradually evolve towards the light. That day the Masters call the “Day of Days” will be a day without precedence. There has never been a day like that. No one on Earth has experienced what they will feel on that day. You will tell it to your children and they will tell it to theirs; people will tell it to their children and so on for generation and generation. Maitreya comes to bring revelation upon revelation. He comes to reveal the nature of the UFOs; the nature of our identity with God and a new approach to God – not through belief but through knowledge, understanding and evocation. We will come to evoke God and see that we are that which we evoke. We will see how rich and worthwhile life has become just in one day. That is the promise of the coming of the Christ for all people. He comes for all people, religious and non-religious alike. He is not concerned with whether you are religious or not. He is concerned with whether you love your fellowmen or not. That is the measure. 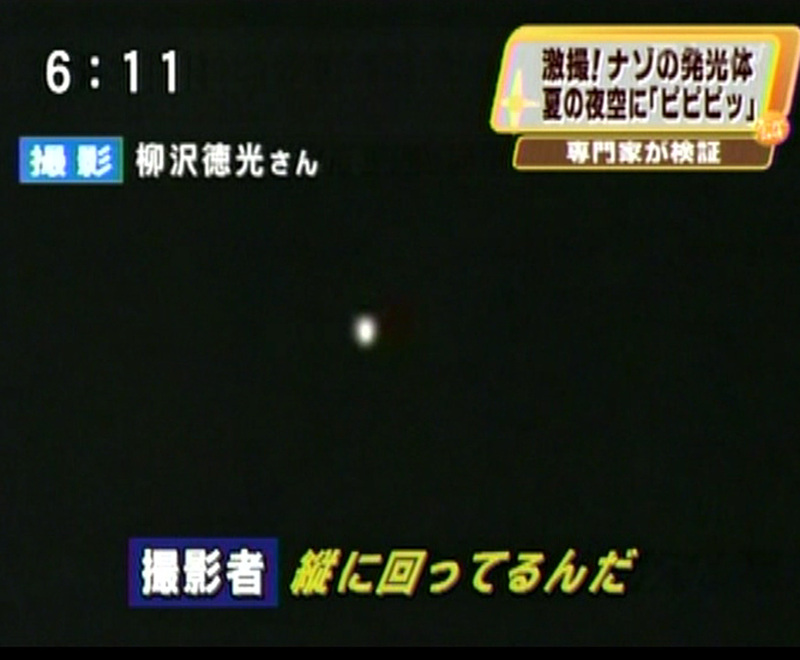 A ‘mysterious luminary object in the summer sky’ was recently reported on nationwide Japanese television station. 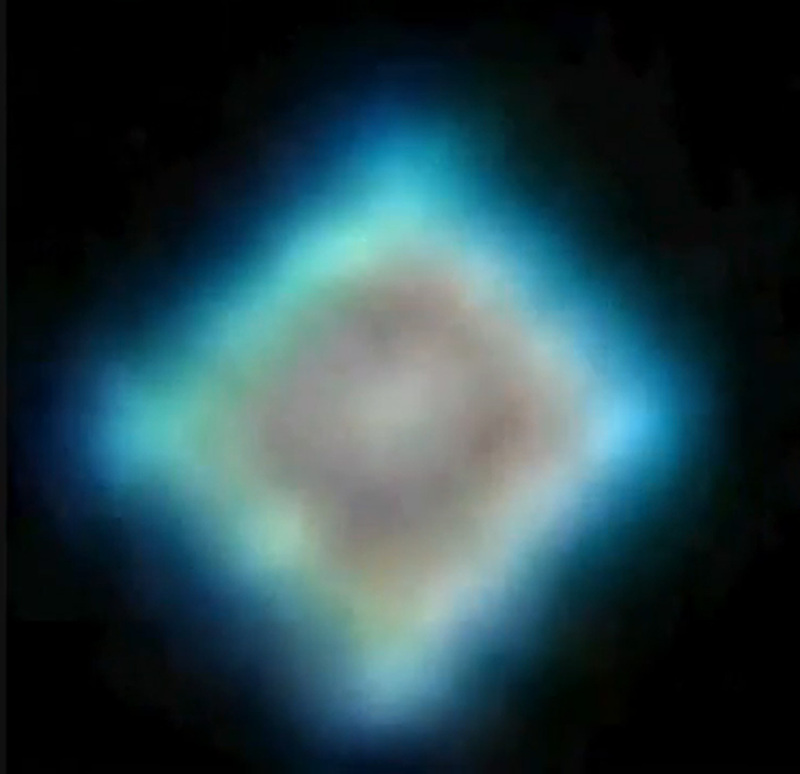 On 17 July 2009, Japanese Fuji Television during its evening Super News programme reported the story of a bright, moving, star-like object and showed a video taken by a viewer, Mr Tokumitu Yanagisawa. Taken on 2 August 2009 at 4.41am, in Nuremberg, Germany, by K. M.
Taken on 22 August 2009, Beijing, China, by T.W. 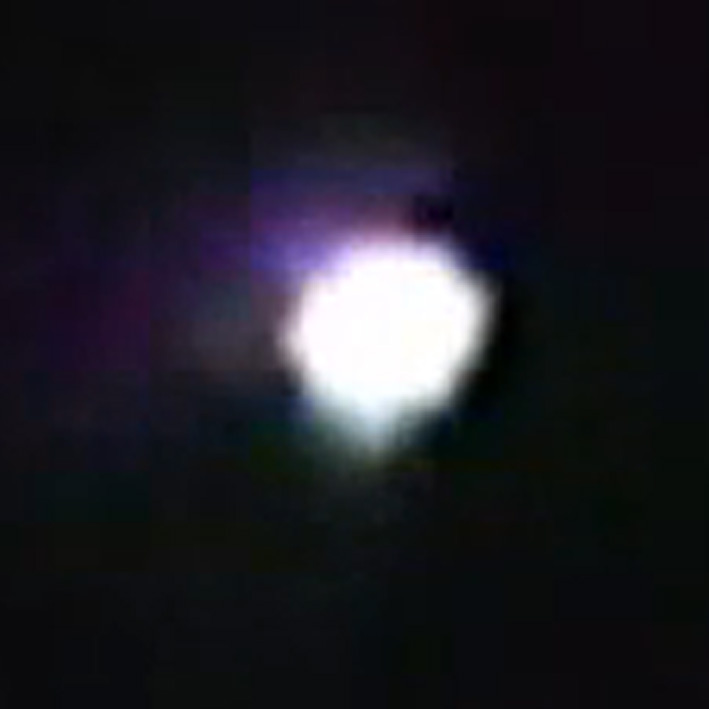 On 4 August 2009, during the closing minutes of the evening programme on Radio 10 AM 710, Buenos Aires, Argentina, someone raised the issue about a sighting of a strange light in the sky. Several listeners called confirming that they too had seen it. Was this light the ‘star’ heralding Maitreya’s emergence? S. M., Buenos Aires, Argentina. On Thursday 16 July 2009 at 11.30pm I was looking up at the sky around my house and noticed a very bright twinkly star low in the sky. In my mind I asked the star: “If you move a tiny bit I will be more certain that you are really that star-like luminary body”. To my great surprise the star started to move very quickly from the south-west to the east, from the front to the back yard of my house. To my even greater amazement the star – looking brighter and bigger – turned back to the front at a high speed and disappeared behind the clouds. There was no noise or jetstream as with a plane. This event took a few minutes. Was it a spacecraft? On Sunday 30 August 2009in La Grande Motte sur Mer, south of France, between 9.30pm and 10.30pm we saw what looked like the ‘star’ above the sea to the right of the moon in a south-westerly direction. Between 11.15pm and 1.15am the star was to be seen left of the moon in a south-easterly direction. 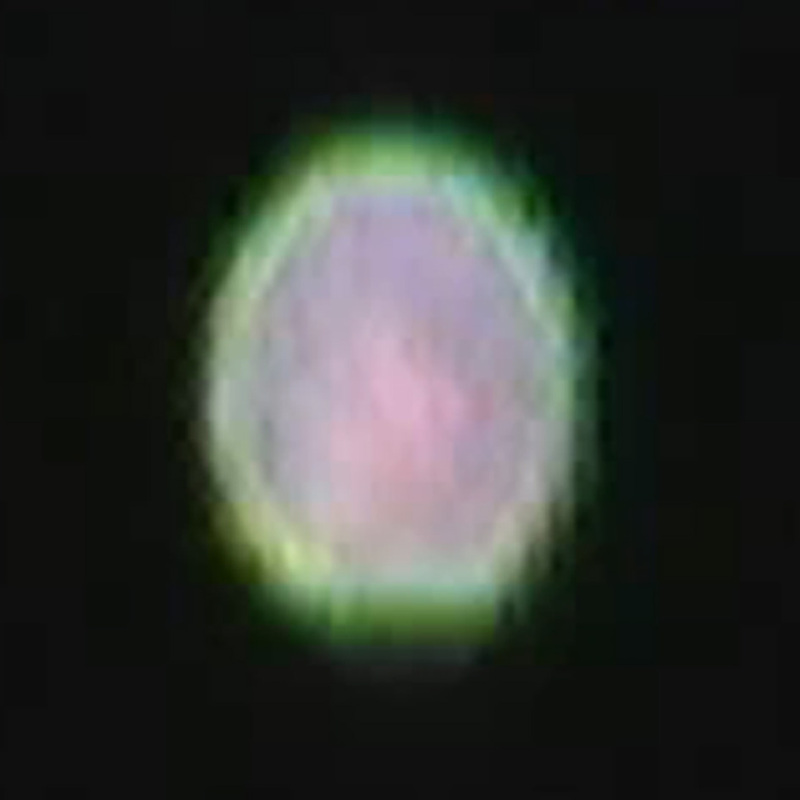 It pulsated really clearly, moved and changed colour (all sorts of colours, in fact). Was this the ‘star’? I have been following your website for 12 years now and I value it tremendously. Sometimes we hear something that speaks from the heart and our souls know it is the truth. That’s how I feel about the coming of Maitreya and the information you put out. So thank you! There is a question I would like to ask. 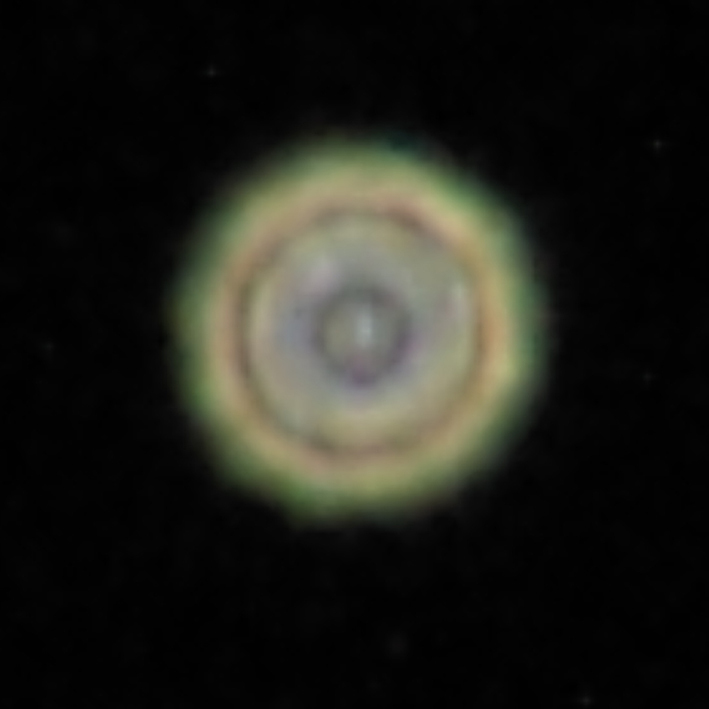 Around 4am on 4 July 2009 in Delaware, USA, I thought I saw the ‘star’. 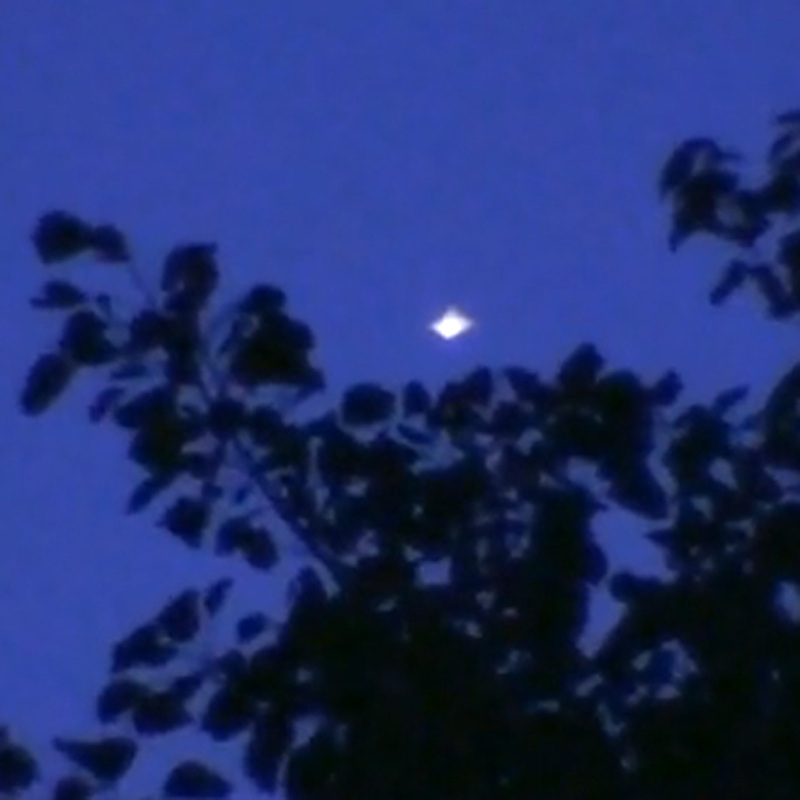 It was the only star up in the sky and it was extremely bright and appeared to be larger than normal. When I looked through binoculars it appeared to be a lot of white circles and the whole thing moved on its side and then on its back and then it kept changing. (But I did not see colours, just white circled lights.) 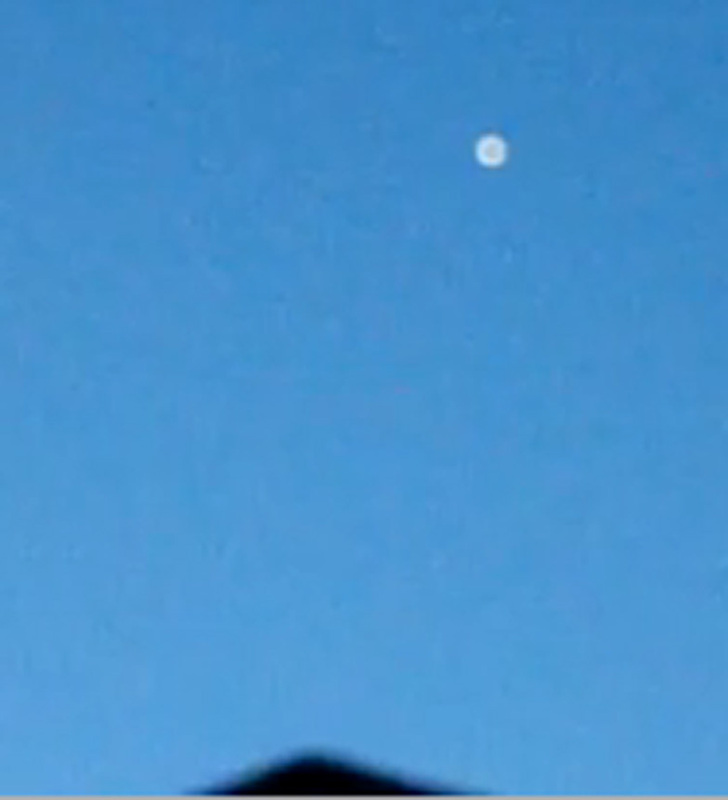 Was this a UFO? B. O., Wilmington, Delaware, USA. On 24 June 2009 after Transmission Meditation I was cycling home. It was all cloudy. When I went over the Stone Bridge I noticed a big, bright star below the clouds, moving slowly from north to south. It pulsated and looked like a fireball. The whole thing lasted about five minutes. When I arrived home I telephoned a group member living in Berlin and told him what I had seen. Five minutes later he phoned back and told me that right after our talk he went on his balcony with his wife and son and they all noticed the same thing in the sky: a bright star, moving, and looking like a fireball. Was it the ‘star’? On Saturday 20 June 2009 a friend and I left the Art Cinema in Hilversum, the Netherlands, around 11.30pm and drove along the motorway towards Blaricum when we saw a very strange spectacle in the sky in the direction of Almere: on the left in the sky we saw a very bright star and to its right a kind of ‘cloud’ of at least 15, but maybe even 20, lights. After we left the highway we stopped the car, but then we only saw the bright star that was moving away from us, slowly, and eventually disappeared. We both thought it could be a UFO mothership surrounded by a number of UFOs. We are very interested to know what we saw? 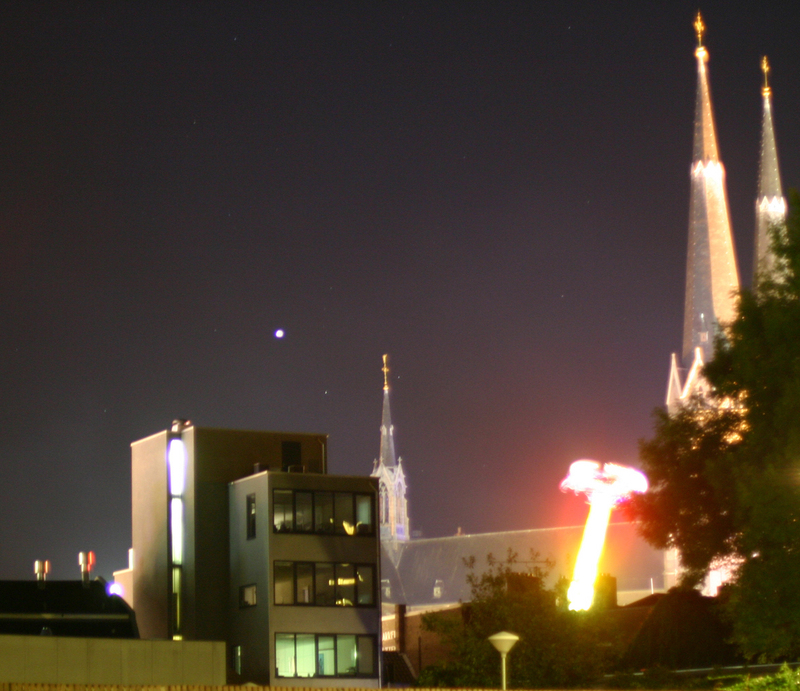 It was 28 July 2009, at 12.19am, that I saw a star from my home in Maastricht, the Netherlands, that made me wonder; it was south-south-east of Maastricht. And at 4.48am there was another star in the east over Margraten, but this ‘star’ was higher up in the sky. 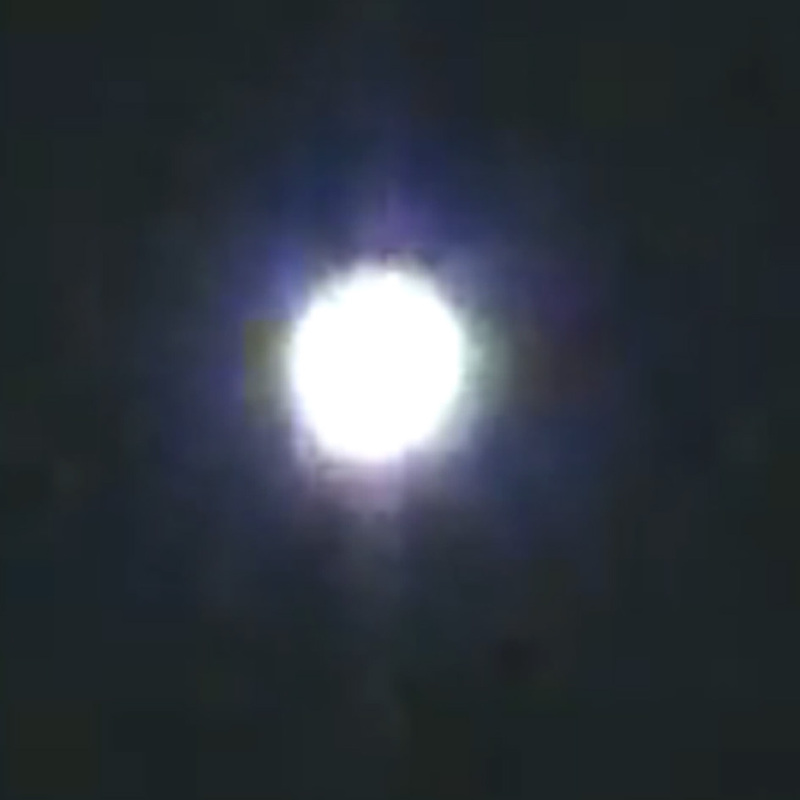 (1) The star at 12.19am was spherical with a clear diameter and an enormous luminosity. 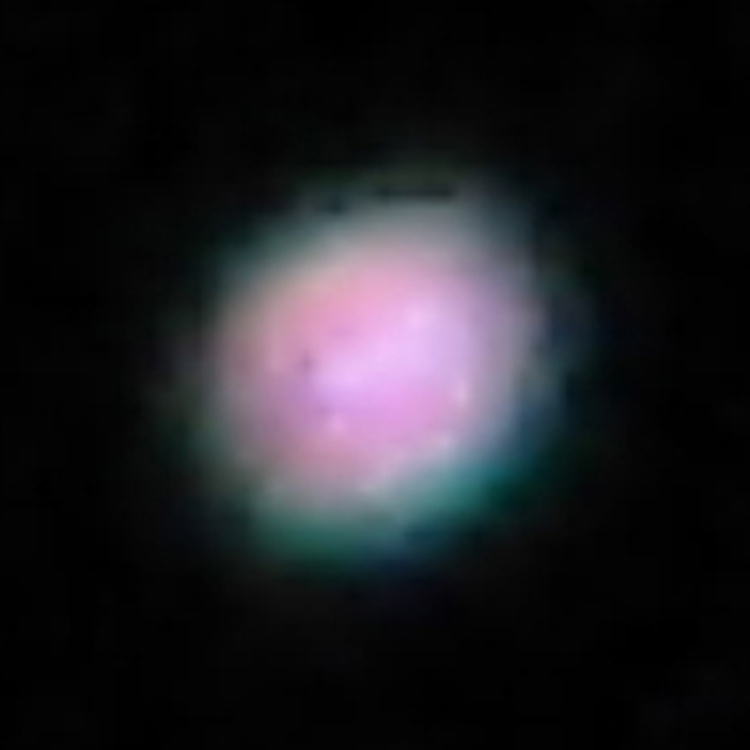 (2) The star of 4.48am looked kind of butterfly-like. It was shaped like a triangle with indentations of light in it, that made me think of a butterfly, and the points sparkled brightly. (3) I saw also a star at 12.19am on the west side. It was smaller in diameter and was sparkling less brightly than the ones I described above, but was still remarkable compared to the other visible luminaries. Did I see the ‘star’? On 27 July 2009, my girlfriend and I were again looking at the sky at the three stars which are always there, always shining, always first to appear at the evening sky and shining more than all the other stars – one directly above, one to the south-west, and one to the south, just above the horizon. This last one is constantly changing colour to red, so everyone can see it. Yesterday, my girlfriend was sitting outside, looking at the star right above and searching to see if the fourth star would appear. This fourth star is a bit tricky, because it is always on the move. As strange as it sounds, this is what happened: she called for me to come outside, and we sat there, looking together. Out of nowhere, this fourth star appeared, travelling across the sky, in a northerly direction. It didn’t travel from the opposite direction (from the south), it just appeared in the centre of the sky, travelling north. We saw the star and wondered if this was the ‘star’, because it was shining the same as all the other stars. I myself was thinking if that is all, then its nothing special. My girlfriend was thinking: “Get bigger, and brighter.” Then suddenly, the star blinked, just like a lighthouse at the sea at night. We were stunned, we just couldn’t believe it, but the star, as if hearing our thoughts, blinked again, and again, and again, five times in a row. What is really interesting is this wasn’t a one-off event. We had seen it before. We usually walk the dog every evening around 8pm, and I go running every second day for an hour. I saw this fourth star for the first time when I was running – it was travelling from west to the east, in the northern part of the sky. The next time we saw it together, it was travelling in the same direction, but just above. The third time my girlfriend saw it, again travelling across the sky. On the fourth time, we went for a walk with the dog, as usual. All the time I somehow knew that we would see it again. We were walking for an hour and we were almost back at home, so I thought to myself, better luck next time. But despite this, I looked again at the star shining just above, thinking to myself: “Light up, Light up! Light up!” And then it appeared out of nowhere, in the vicinity of this star just above. My girlfriend started shouting and then it blinked. As I had wished. It was there for 5 seconds and then it was gone. Are these the four stars? How many articles or books have you read that left you with some indelible impression, as if you understand the meaning of life all of a sudden, or as if you’ve lived the experiences of the author yourself? Many readers of Share International will probably list one of Benjamin Creme’s books, or an article or interview about the Reappearance, as such an experience. Undoubtedly, most people will have a personal literary favourite, like one of Shakespeare’s works. But frankly, once you’ve been acquainted with the Ageless Wisdom Teaching, how often do you come across any type of book which leaves you with a sense that you’ve actually experienced something? There wasn’t much to the subject of Angels in Starships that prepared me for the experience that reading this 1983 book by Giorgio Dibitonto proved to be. The author describes how he and two of his friends are contacted by the Space Brothers in 1980 and, over a period of many months, are trained for more intensive contacts and experiences. Eventually they are taken on several journeys in spacecraft, where exalted beings teach them valuable lessons about life on Earth and on other planets. Mr Dibitonto and his companions are also asked to extend warnings of impending strophe if humanity does not change its course. The overtly Christian tone and references initially formed a test of my open-mindedness, as it took me a good year-and-a-half to finally sit down and read it properly. Until then, the most interesting aspects appeared to be Benjamin Creme’s remarks about George Adamski’s Venusian origins in the publisher’s foreword, and the fact that the author was introduced to the Space Brother who lived on earth as Adamski (as confirmed by Benjamin Creme’s Master in Share International, October 2008) by the very Space People whom Adamski had introduced to the world in his books as the Saturnian Ramu, the Venusians Orthon and Kalna, the Martians Firkon and Ilmuth, and Zuhl. On his first encounter with his celestial contact, the author is told: “It is not the first time that we have met with men of Earth in this manner ... In your holy scriptures you have read that the Lord spoke to men of Earth from out of a cloud; your present encounter is no different from that which was experienced by your forefathers throughout the ages.” Many references to the biblical “pillars of cloud by day and pillars of fire by night”, which led the Israelites through the wilderness, are explained here as UFO’s guiding humanity through testing times – both historically and at present, while the angels and archangels of the Bible are revealed here to have been Space Brothers. Although clad in Biblical terms, the information that Mr Dibitonto is given coincides in many ways with the information from Benjamin Creme and his Master about the transition from the old Age of Pisces into the new Age of Aquarius. A striking example is when Orthon and Firkon discuss, as one of the signs heralding this transition, the manifestations of the Master Who was the Madonna, Who they say “appears on Earth far more often than most people are aware. Several times she has certified her presence with signs that arouse awe and wonder, such as at Fatima.” Raphael explains that the time has come for the fulfilment of the third prediction of Fatima, which Benjamin Creme has described as “the fact of the Christ’s imminent appearance in the world” (Share International, October 2000). Despite the unmistakable Christian overtones in the author’s narration, in a subtle, indefinable way Mr Dibitonto’s description breaks down the barrier between our conscious experience of dense-physical life on Earth and, not just life on other planets, but, it seems, life on the higher, inner planes of existence, leaving the reader as a result with an overwhelming sense of oneness, similar to what is experienced during a blessing by Maitreya. The reality of which this book speaks is not conveyed through the words which the author chose to describe his experiences and the teachings and revelations which he and his companions received. Yet the reality of our interconnectedness, not only as a human family on this planet, but with every expression of Life throughout the infinite cosmos, speaks from this book in a way words alone could not achieve. It seems to present itself through a definite heightening of one’s conscious awareness which lingers on for several days afterwards to the extent that it is more difficult to understand humanity’s violation of itself as seen daily on the news, or even to enjoy what one would previously consider ‘innocent’ forms of entertainment, such as watching a television series or a film. Reading this remarkable book evoked in me a more profound understanding of our connection with and our place in cosmos as the body of the Creator, where humanity will only be allowed to roam free when it realizes, and acts from an experience of, its essential oneness with all. Q: From the information which the Space Brothers give in Mr Dibitonto’s book it would seem that most, if not all, of the angels and many of the prophets in the Old Testament were Space Brothers. Could you comment, please? Benjamin Creme: None of the prophets were Space Brothers but members of the Earth’s Spiritual Hierarchy. Some of the ‘angels’ were indeed visitors from other planets. Q: The ‘cosmic blessing’ which Mr Dibitonto describes in chapter 15 of his book involves Space Brothers whom the author refers to as “the Blessed Lady” and “the Lord”, in a thinly-veiled reference to the Madonna, and Jesus or the Christ, respectively. Was the event which Mr Dibitonto described here attended by the Master Who was the Madonna and the Master Jesus? Or were They Space Brothers of much the same ‘standing’, if one can use that word here? Benjamin Creme: They were the Master Who was the Madonna and the Master Jesus. Q: On several occasions the Space Brothers are said to warn of catastrophic events which await mankind because of its wrong thoughts and actions, reminiscent of the biblical Apocalypse. Could it be that the Space Brothers rather warned about the collapse of our present outmoded structures, while the author interpreted these warnings according to his own (apparently Christian) understanding of events surrounding the Second Coming? Benjamin Creme: No. They were warning against the catastrophes of global warming and the degradation of our environment, the planet. Q: The Space Brother whom George Adamski called Ramu identifies himself here as Raphael. Because of the name, but also because of the type of experiences which Mr Dibitonto describes in his book, I was reminded of the advanced being who took Vera Stanley Alder on a tour of the inner planes, both in micro and in macro cosmos (if such a distinction exists on the inner planes! ), which she wrote about in her autobiography, From the Mundane to the Magnificent. Was hers the same Raphael as Mr Dibitonto’s contact from space? “In the post-Cold War period,” said Yukio Hatoyama, Japan’s new Prime Minister, in an article published by the New York Times, “Japan has been continually buffeted by the winds of market fundamentalism in a US-led movement that is more usually called globalization. In the fundamentalist pursuit of capitalism people are treated not as an end but as a means. Consequently, human dignity is lost. Hatoyama continued: “The economic order in any country is built up over long years and reflects the influence of traditions, habits and national lifestyles. But globalism has progressed without any regard for non-economic values, or for environmental issues or problems of resource restriction. “In terms of market theory, people are simply personnel expenses. But in the real world people support the fabric of the local community and are the physical embodiment of its lifestyle, traditions and culture. An individual gains respect as a person by acquiring a job and a role within the local community and being able to maintain his family’s livelihood. “Under the principle of fraternity, we would not implement policies that leave areas relating to human lives and safety – such as agriculture, the environment and medicine – to the mercy of globalism. Sixty three Nobel laureates, 202 Members of the European Parliament and other world figures such as Martin Gray, Noam Chomsky, and Michel Rocard, former Prime Minister of France, have so far signed the “Open the doors” appeal launched in spring 2003 by an NGO called ‘Peace Lines’. The appeal calls on Israel to end forever the siege of Gaza. “More than 1.5 million people are trapped inside Gaza’s borders, exposed to total arbitrariness,” the appeal claims. Before the siege began in 2007, Israel had drawn up a list of 4,000 “authorized” products that could be delivered to the Gaza strip. Now only 30 to 40 products are actually allowed through to Gaza’s citizens. Mattresses, sheets, shoes, clothes, books, tea, coffee, are all forbidden, as are concrete, doors and window panes, despite the urgent need to rebuild because of the destruction caused by the Israeli bombing during the last attack. The appeal asks Hamas to release detainee Sergeant Shalit of the Israeli army, while Israel should release a significant number of over ten thousand Palestinian prisoners, including all the elected members of the Palestinian legislature. Among the signatories are Nobel Peace Prize laureates Archbishop Desmond Tutu, the Dalai Lama, Shirin Ebadi, and Mairead Maguire from Northern Ireland. Maguire previously distinguished herself by accusing the municipality of East-Jerusalem of “ethnic cleansing” against the Arab community. Dozens of Arab homes are under threat of planned demolition. “I think that the Israeli government is conducting a politics of ethnic cleansing against the Palestinians here in East Jerusalem, which is contrary to human rights and against the dignity of the Palestinian people”, said peace activist Maguire. More than 1,500 Arabs are in danger of losing their homes in this the largest eviction operation since 1967. The pretext used is that the houses were built or extended without Israeli permission, but the Arabs claim that it is virtually impossible to get such permission. More than 10,000 Palestinians live in this area, against only 60 Jewish families. According to the Israeli peace movement B’Tselem more than 400 houses in East-Jerusalem have already been destroyed by the Israeli government.